Your tourist information and holiday booking guide to this beautiful island in Greece. The magical island of Kefalonia is one of Greece's most beautiful holiday destinations, every year thousands of tourists from all around the world visit our shores. The Kefalonia.co.uk website has been developed to bring you all the information you need to help you book your trip to the island. We have resort guides with details on the best holiday destinations, weather and maps along with a fantastic range of accomodation and some great deals on holidays and hotels. We look forward to offering you a friendly welcome and would love to see you enjoying a sun-filled Kefalonia holiday on our fantatic island soon! We have a wonderful range of holiday accommodation. 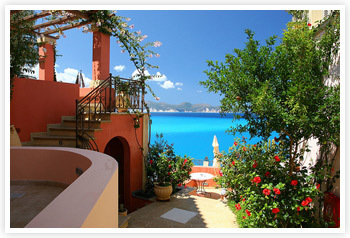 From chic hotels, private villas with infinity swimming pools to traditional Greek houses with stunning sea views. Skala is our number one holiday resort destination and has a truely wonderful beach. Lourdas is a stunning village resort with great beaches and countryside walks. Katelios is a relaxing resort in the South with a great beach and sometimes Loggerhead turtles! Svoronata is a quiet village resort situated about a mile inland with a great local beach. Chalikeri is one of the quieter resorts but is only 9km from Fiskardo if you like to explore. A great way to see the island is to hire a car, find cheap car hire here. Lassi is one of our more lively resorts great for families and couples alike. Assos is one of the most beautiful villages on the island but has very little accommodation. Fiskardo has one of the most beautiful bays, and is the perfect place to relax on holiday. Lixouri is one of the quieter resorts perfect for finding secluded sun spots to relax. Spartia has only a small village but is a perfect quiet retreat for finding secret coves. Our weather is normally sunny, read our islands latest weather reports online. Why does the island make such a great holiday destination? Holidays here have something for everyone - from family beach holidays to romantic dream breaks. Although the island isn't vast it manages to offer a holiday experience that is suitable for everyone. Wherever you stay you will never be far from a one of the best beaches in the Mediterranean and all have the most clear blue water imaginable. Like most holiday destinations there are busy and quieter resorts to choose from but even the more romantic and quiet resorts have all the facilities you could wish for. Kefalonia is particularly well known as a romantic destination and is therefore very popular with couples who are in love, looking for a perfect time to share together. This is complemented perfectly by the vast array of villas and boutique hotels taht you are able to chose from and as resorts are often in a smaller scale they offer a more relaxing ambience that many other Greek destinations simply cannot match. You will find villas and hotels with the most amazing private "infinity" swimming pools with endless views over the ocean - there is simply no better way to relax with someone you love. The most popular and bustling holiday resorts in Kefalonia are based in Lassi which is near the capital of Argastoli and in Skala which is in the South of the island. They are certainly the busiest resorts and are well worth a visit especially if you have children in your party as they boast some of the best beaches in Europe. Lassi has Makris Gialos and Platis Gialos beaches and Skala has a beautiful beach of fine golden sand that stretches over a full mile in length all surrounded by a wonderfully clear blue ocean that is so beautiful in colour it is hard to believe. As the largest of the Ionion Islands in Western Greece, it has - in recent years become a popular holiday hot-spot with tourists from all over the world, particularly popular with people from the UK and the USA. The name of the island is thought to stem from Greek mythology, in particular the mythological figure Cephalus. The name has altered over the years and now is thought to refer to its unusual head shaped coastline - it derives from Ciphalis which is Greek for head. It's name has numerous different spellings and may be known as Cephallenia, Cephallonia, Kefallinia, or Kefallonia depending on where you come from. While the island is fairly large in size (Keflonia is the largest of the Ionian's) it actually has a particularly small and condensed population of just 45,000 inhabitants with roughly one third of those being localised to the capital city of Argostoli. The second largest Kefalonian settlement is located in Lixouri which is just north of the capital. The rest of the pouplation is spread ove the island with many living near the resorts and working in the growing tourist industry. Only 20 years ago this great destination was a sleepy place, dominated by fishing has transformed its image following the hugely popular release of the Hollywood blockbuster Captain Correlli's Mandolin. This hollywood blockbuster about a forbidden love in World War Two bought actors Nicholas Cage and Penelope Cruz together to film here using the stunning landscapes to caputure the romantic setting perfectly. The picture was a sell out success and following its release in 2001 millions of people worldwide were captured by the films beautiful cinematography and film fans from all over the world booked to see the wonders of the island for themselves. To this day it remains a tranquil island - and while it is still mostly unspoilt it has evolved somewhat in recent years to accommodate the every growing influx of tourists and is now developed enough to offer a fantastic holiday experience with something for everyone.